If your Asus Zenfone 5 doesn’t boot up right after you installed an app or tweak something in the system. It keeps on shutting down and restarting again, chances are your device is on a bootloop. How to get out of it and boot your phone normally? Here is the bootloop solution for Asus Zenfone. 1. Download the ADB fastboot tool and extract it in a folder. 2. Get the latest firmware for your Asus Zenfone and extract the downloaded file the folder where you extracted the ADB Fastboot Tool. 3. Turn off your device and boot to recovery by pressing and holding the power button, volume up and down rockers simultaneously. Don’t release the buttons until the recovery menu appears. Apply the update from ADB option. 4. Connect your device to your PC or Windows laptop using a compatible USB cable. 5. Open the command prompt inside the adb fastboot tool folder. 6. 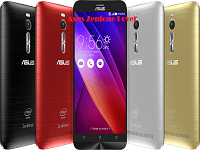 Type adb devices then enter, if connection is successful there will be a list of Asus Zenfone devices. 7. Type adb sideload file.zip (file.zip = the name of the packages you want to flash) then enter. 8. Wait until the flashing is done. This method may void your warranty. The author is not responsible for any problem that may happen during the process. Do this in your own risk!